We also ventured out for lunch with both boys to Taste Unlimited, a yummy (and very popular) spot, just down the street. Taste Unlimited’s Hampton Boulevard location offers a large gluten-free sandwich menu and they use a separate sandwich making station and utensils for all gluten-free orders, to prevent cross-contamination. Their sandwiches are delicious (reminiscent of my gluten-filled college days spent frequenting Bel Air and Take it Away) and I’m a huge fan of their house dressing. 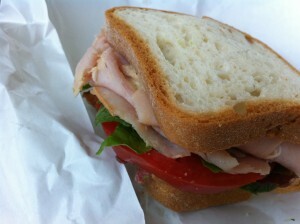 I got their Northender sandwich, which includes the amazing combination of turkey, havarti, bacon and avacado. The sandwich gods were looking down on me because they put practically an entire avocado on my sandwich. I went with the house dressing in lieu of the aioli mayo because I just can’t resist the stuff. (You can buy their house dressing by the container too…this would be way too dangerous for me.) All in all, my sammy was a messy, delicious masterpiece. Also, if you check Taste Unlimited’s website, they tell you which of the daily prepared foods are gluten-free. (They make take out foods like chicken salad, ribs, cucumber salad, etc.) A perfect weeknight dinner when you don’t feel like cooking OR if you’re going to be entertaining someone with a gluten allergy and feel overwhelmed by the task. 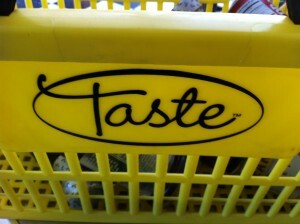 Taste Unlimited is a great option. Save room for dessert because Taste Unlimited offers glow gluten-free cookies, in multiple varieties, and Tate’s Bake Shop GF chocolate chip cookies. 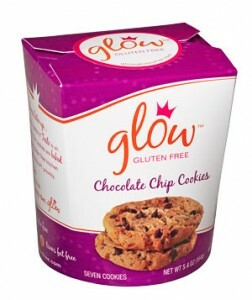 I bought glow’s chocolate chip cookies and they were yummy. They don’t skimp on the chocolate chips, which is key for GF baking! I love their packaging…looks similar to a Chinese food take out box. There are enough cookies in a box to share with your group. (If you’re feeling generous!) Their other varieties include snickerdoodle and ginger snap. You know me, I can’t resist chocolate! Right now Taste Unlimited offers their gluten-free menu at their Newport News location and this fall they’ll roll it out at their new (and bigger) location in Virginia Beach. 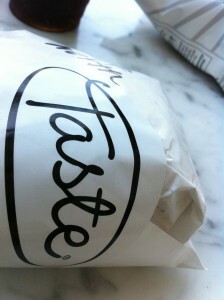 I contacted the folks at Taste to get more details and it turns out that one of their co-owners was diagnosed with celiac in 2009, hence the efforts they’ve gone to in order to accommodate customers with gluten allergies or celiac. I feel reassured when I know that someone personally involved with a restaurant has celiac because it means they get it, and they’re not just serving GF bread for their sandwiches. Taste Unlimited is taking all necessary precautions to ensure my safety, for which I am grateful. AND they make delicious sandwiches!